I posted my Year in Reading of 2011 highlights over at tumblr. Feel free to check it out. May reading in 2012 be fruitful, entertaining, enriching, and enlightening! Like I noted last year (see here if you’re so inclined to see my 2010 list), my notable tv highlights of 2011 are likely much different than others since, for various reasons, I again drastically cut back on tv viewing and much like other people, my tv viewing seems to be more online these days (which is how I view and otherwise caught up on “Community”). d. David Bianculli (his discussion with Terry Gross on the best and worst of tv 2011 on NPR’s “Fresh Air” – with his observations on the segment on his site and here, and his other lists of tv 2011). 1. “Community” – I’m caught up, more or less. a. The foosball episode was funny and heartbreaking (at least on the Jeff and Shirley storyline). b. The multiverse episode was memorable; I think we’re not in the Evil Abed and Evil Troy universe. Also, do not let Jeff play with dice, thereby creating a multiverse. c. And, how weird and funny is it that Luis Guzman, the real actor, made a guest star appearance as actor Luis Guzman, the most famous alumnus of (fictitious) Greendale Community College? And, he loves Greendale, if only because it was where he – uh – met lots of girls back in the day. From what I can tell, I think the arc of season 2 – from Jan. to May 2011 was the arc on Pierce (he is a very, very strange man), but the arc of season 3 – from Sept. 2011 to date – has been, even if it’s in the background, about Jeff’s evolution. Jeff has been too-cool-for-school, but he takes a lot of effort to get there, and so far this season, his issues definitely kept popping up. He matures somewhat, but his line between sanity and insanity looks like a thin one. I hope that NBC will keep the show on, if only to let the gang graduate (or, in Pierce’s case, probably not graduate, since I’m not clear if he’s really there for any degree, or whether Senor Chang or Dean Pelton can escape their looniness…). 2. “Fringe” – well, it’s been a crazy trip this year with “Fringe” (time traveling, many universes, and who’s evil and who’s not, and what is evil?). I still miss the blue universe, but we’ll see what will happen to Olivia and the gang – especially with Peter Bishop being the odd man out this time, striding between universes that make it apparent that he is the one who doesn’t belong. 4. Nova’s “The Fabric of the Cosmos” with Brian Greene was fascinating viewing. 5. Masterpiece Mystery! was pretty entertaining this year, with Rufus Sewell as the Italian detective Aurelio Zen, more Inspector Lewis (well, I fell behind, unintentionally), and even Jason Isaacs as Jackson Brodie (mmm, Jason Isaacs!). 6. I got around to watching some “Melissa and Joey” this year… (well, I mention it because nostalgia tv is quite a trend, for better or worse, and seeing some homages to 1980s/1990’s style of tv was strangely amusing). 7. The Royal Wedding! (of course I’m a sucker for the pageantry). 8. The marathon of Republican primary debates was the wacky reality tv of 2011, I must say. We’ll see what will be the results in Iowa next week. 9. I still think that the NHL Winter Classic is quite a tv thing to view, if only for the amazing visuals of an outdoor hockey game. I mention it because it’s coming again soon… (I hope it’s cold enough for it, though). 10. I was horribly inconsistent about watching “Doctor Who” and “Law and Order: UK,” which I can now watch thanks to finally having BBC America, but still: I now have BBC America! Some major misses on my part in tv viewing: I completely didn’t get to watch “Downton Abbey” on Masterpiece (PBS) and “Justified” on FX. And as I don’t have HBO, I didn’t get to watch “Games of Thrones.” And, since I don’t have Showtime, I didn’t get to see Damian Lewis on “Homeland.” I also fell behind on “Archer” and missed the final episode of Michael Scott on “The Office.” I’m not on the “Breaking Bad” or other trendy bandwagons, so I’ll leave it to the lists of others to go into them. Addendum: oh, yeah, 2011 was the year of Watson on Jeopardy on tv (see Ken Jennings on Slate about the experience). I somehow managed to watch the next-to-last episode of “American Horror Story” on FX, with the harrowing birth of the (likely) Anti-Christ and with more ghosts. Riiight (weird show, that one). The media tried hard to convey the calamity of Japan’s earthquake/tsunami/nuclear disaster; the scenes on tv were just hard to watch and unavoidable. A major 2011 announcement, with the death Osama bin Laden, in the post 9/11/01 era. The passing of many, including Steve Jobs. The other natural calamities that were locally-occurring: snow, tremor, and hurricane; (ridiculous; not eager for the locusts or the Mayan Apocalypse of 12/22/12). I am probably completely forgetting many other tv highlights of 2011. May 2012 be enriching, enlightening, and so forth. 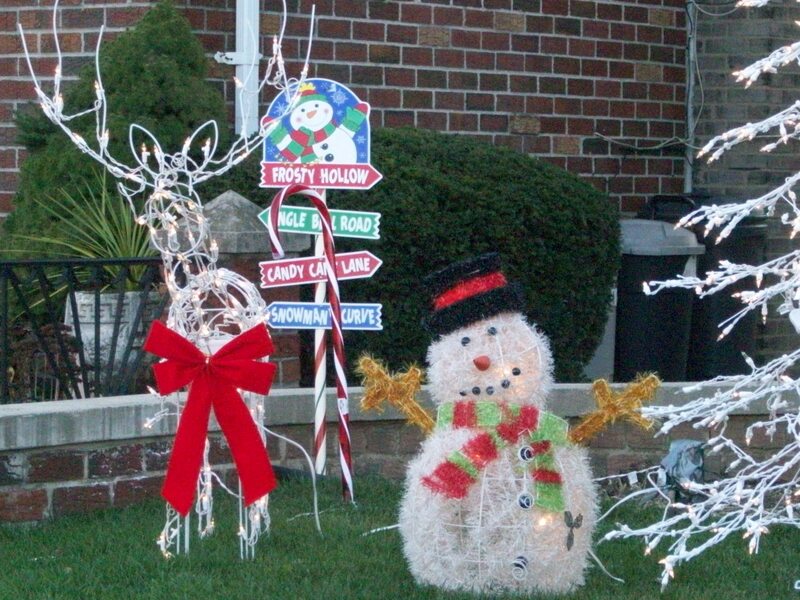 A Bensonhurst Christmas, in Brooklyn, NY, brought to you by a reindeer and Frosty. Merry Christmas to you all! Author ssw15Posted on December 24, 2011 December 24, 2011 Categories BrooklynLeave a comment on Merry Christmas 2011!